Bridalveil Fall is one of the most famous and recognizable waterfalls in Yosemite National Park, welcoming visitors as they first enter Yosemite Valley. 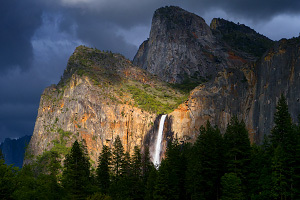 While Bridalveil Fall can be seen from many prominent roadside viewpoints as you drive in from the north or south (most notably the famous Tunnel View along Wawona Road), there is also a short paved trail that you can hike to get close to the base of the falls. Bridalveil Fall flows year round, but it is most impressive in spring and early summer when snowmelt adds to its awesome beauty! Be prepared to get wet as the mist can be significant during high flow. 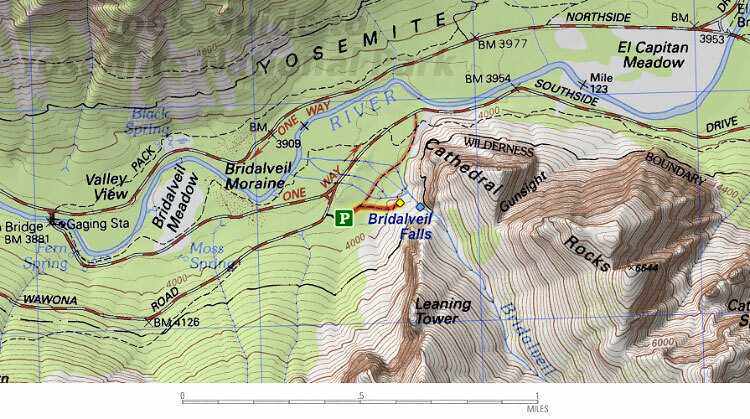 While Bridalveil Fall is located in Yosemite Valley, it is located roughly 4 miles west from Yosemite Village, so if you are hiking from one of the popular campgrounds or lodges, it's a bit of a trek along the Valley Loop Trail to get to the falls. If you are driving, the parking lot is located along Wawona Road (the road that enters Yosemite from the south) near the junction with Southside Drive. While the parking lot is fairly large, it can get crowded during popular summer days and cars waiting to turn into the lot often create gridlock situations. The "hike" itself is very easy and pleasant. From the east side of the parking lot, follow the paved trail through the forest and head up the short spur trail to the viewing area near the base of the 617-ft tall waterfall. This area is most impressive during a big spring runoff as the boulder-filled forest turns into a beautiful river and you can often see rainbows from all of the mist in the viewing area. This short stroll to the base of one of Yosemite's most beautiful waterfalls is one of those must-do activities, but be careful when you visit. In the morning and early evening you can usually find parking, but if you try to park here at 2pm on a summer weekend, prepare to experience city-like traffic jams and misery.